ROBERTSDALE, Alabama (November 28, 2018) – Baldwin REALTORS®, the professional trade organization supporting the success and advancement of its 2,300 REALTOR members is giving back to the local and regional area with a donation of over $21,000 this month. During the association’s annual Thanks & Giving lunch, $15,000 was donated to local charities: South Alabama Out of the Darkness Walk-American Foundation for Suicide Prevention, Ecumenical Ministries, Mary’s Shelter, Home of Grace, The Shoulder, The Baldwin County Trailblazers for The Walking School Bus, Prodisee Pantry, Habitat for Humanity of Baldwin County, and Feeding the Gulf Coast’s Backpack Program. 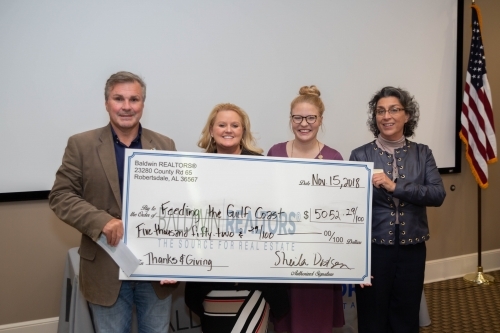 Baldwin REALTORS also donated $6,000 to the Florida REALTOR Relief Foundation for victims of Hurricane Michael. Thanks & Giving is a time for association members to thank the local charities in the community for their work and to thank members for their hard work and dedication to the association, like affiliate members, committee chairs, and Omega Tau Rho Inductees — REALTOR Emeritus members who have been a REALTOR for at least 40 years. This year, four Baldwin REALTORS® members were inducted into the Omega Tau Rho fraternity of the National Association of REALTORS. Membership in the honorary fraternity is represented by the Medallion of Service which is awarded as a token of the high esteem in which inductees are held by their fellow REALTORS and symbolizes the recognition and appreciation accorded to them for their contributions to the National Association of REALTORS and its institutes, societies and councils. The members who received their medallion from NAR are Sonny Nichols, Associate Broker of Berkshire Hathaway Home Services Nichols Real Estate; Bernice Lindsey, Associate Broker of Bellator Real Estate and Development-Eastern Shore; Sherry Bell-Headrick, Associate Broker of Roberts Bros. Gulf Coast; and Ann Gordon, Broker of Atmore Realty and Baldwin Realty Brokers. Baldwin REALTORS® is the source for real estate in Southern Alabama. We provide resources, education and tools to over 2,300 professionals across the region. We work to protect the interests of property owners, and our members serve buyers and sellers as REAL Advocates, Advisors, and Experts. REALTORS® agree to abide by a strict code of ethics and are held to a high ethical standard by their peers through their association membership. The term REALTOR® is a federally registered trademark owned by the National Association of REALTORS® and denotes membership in the non-profit Association.